For easyJet customers, finding travel information on-the-go is now even easier. 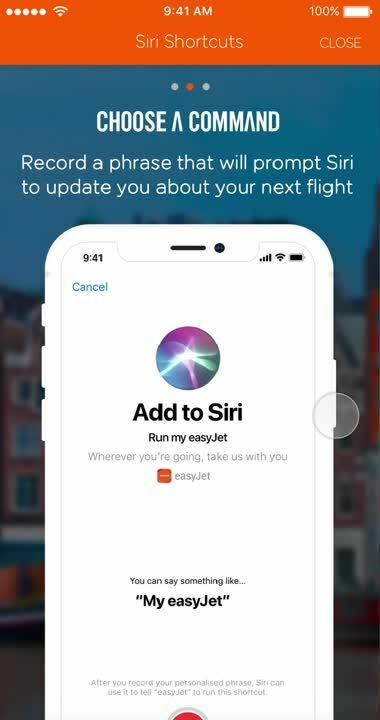 The airline recently launched the iOS 12 Siri Shortcuts feature in its mobile app, allowing travelers to use voice commands to check itineraries and flight information while on the move. Siri Shortcuts allows users to customize the voice command shortcuts available through Apple’s personal assistant. Always striving to deliver the best possible customer experience, easyJet is taking advantage of all the feature has to offer by launching this new update in partnership with Travelport Digital. Travelport Research, which surveyed 16,000 travelers from 25 countries, revealed just how important mobile is for today’s traveler. Almost half of those surveyed have booked and paid for an entire or part of a trip through their smartphone and over 50 percent have used voice to search either during booking or whilst traveling. “Exposing itinerary and flight status information through Siri Shortcuts provides a sophisticated day-of-travel assistant to travellers, offering conversational guidance and real-time, contextual updates on command,” says Cormac Reilly, Chief Customer Officer at Travelport Digital. To activate the Siri Shortcut, just open the easyJet app and tap ‘Add to Siri’. You can then customize the voice shortcut you want to use – anything from ‘My easyJet’ to ‘What’s my flight update?’. Once you've set up your shortcut, you’ll have hands-free access to your itinerary information, all through voice command. easyJet prides itself on providing travelers with award-winning mobile experiences and Siri Shortcuts is just one of the latest enhancements to this market-leading app. In October, easyJet unveiled its Look&Book feature that allows users to organize a trip using Instagram snaps. Since launching in 2011, easyJet’s mobile app has been downloaded more than 28 million times and has significantly evolved to allow travelers to seamlessly manage all aspects of their trip. It continues to achieve 4.5-star ratings and has led with world and European firsts such as the integration of Apple Pay, FlightRadar24, passport scanning, credit card scanning, Lucky Trip, Instagram Look&Book and biometric technology to retrieve customer information. Download the easyJet case study to learn more about how the airline continues to be a leader in mobile travel.